Bitcoin's high profile and low market capitalization make its price per coin extremely volatile. Until it reaches a capitalization high enough to withstand the whims of individual large investors, it will continue to be a roller-coaster ride for speculators. The most dramatic fluctuations in price tend to correspond to astrological transits against the chart for the Bitcoin genesis block. We review some examples here from this year, and speculate on what the future might bring. First, today's dramatic sell-off and partial recovery, related to the federal raid of Silk Road (clearly the busting of nonviolent drug offenders is not affected by the "shutdown"). There has not been a fundamental compromise of the Bitcoin technology, and eventually the government seizure of the coins held there may cause the remaining bitcoins to go up in value. 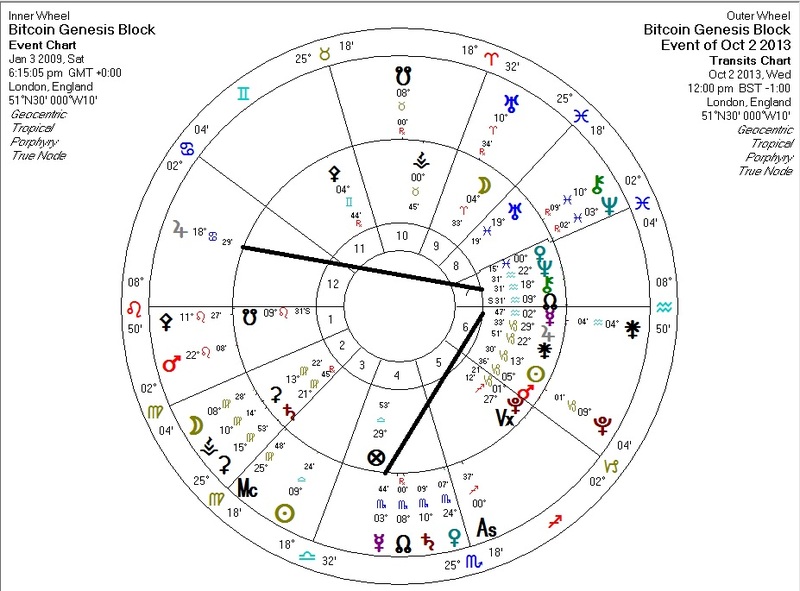 Accordingly, today's transits against the Bitcoin astrological chart reflect temporary conditions. Transiting Jupiter in Cancer the 12th quincunx Bitcoin Chiron: wounding through the incarceration of a benevolent family member. Yet more evidence that Jupiter isn't always nice. Transiting Mercury in the 4th square Bitcoin Mercury (ruler of 2nd): Financial challenge triggered by difficult news from family/tribe. For the spike-and-crash of this April and the slump during the summer, we turn to a transit graph against the first solar return of the Bitcoin chart. I picked up this technique from a recording I purchased of a lecture at UAC 2012, by Dietrech Pessin. She uses the first solar return as an alternate birth chart, against which transits and progressions apply. I now use this technique with my clients, as I find it picks up events invisible to the natal chart. For this April's events, we have Pluto stationing within a few minutes of arc before a conjunction with the first solar return Venus. One might interpret this as a powerful infusion of energy into value, which then withdraws. The sell-off started two days before the exact peak of the station, in response to other transits happening at the time. I actually sold part of my holdings in anticipation of this event. I attribute the price slump of this summer to the South Node forming a trine with the Bitcoin Sun: a symbolic loss of vitality. This coming January, Pluto approaches the first solar return Venus (and the Bitcoin Sun) again, but does not turn back before hitting the exact position. Bets are off as far as I'm concerned: the price could suddenly explode, crash, or both. I'll be holding some coin at that point, but am prepared for the price to go to zero. 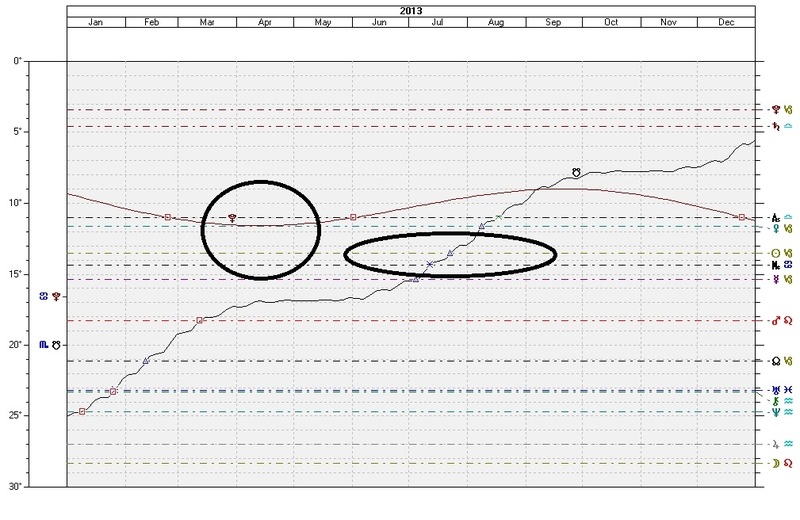 As for the future of crypto-currency in general, I am extremely bullish.